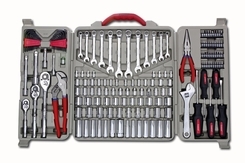 Crescent's 170-Piece Mechanics tool set contains a carefully selected assortment of Crescent brand hand tools needed for most industrial, mechanical, and consumer applications. The set includes 1/4-, 3/8-, and 1/2-Inch quick release ratcheting drives with a wide selection of standard and deep sockets in the most common SAE and metric sizes. Included in the set are the following 3/8-inch drive tools: a 72-tooth quick-release ratchet drive, 2 extensions, a 3/8- to 1/4-inch adapter, 2 spark plug sockets, 25 12-point sockets and 10 6-point deep sockets (SAE and metric). It also includes the following 1/4-inch drive tools: a 72-tooth quick-release ratchet drive, a 3-inch extension, 22 6-point sockets (SAE and metric). Additionally, there are 12 SAE and metric combination wrenches, 2 pliers, 8-inch adjustable wrench, 4 screwdrivers, a magnetic bit driver with 44 driver bits, and 26 SAE and metric hex keys. All tools in this industrial quality tool set meet stringent new ANSI and ASME specifications and come with a full satisfaction guarantee.